The “right to life” is arguably one of the most important human rights. Without life nothing else can follow. As war is one of the greatest threats to life, peace and peace-making, and therefore is an important remedy to human rights abuses. In this context, I have used public opinion research to advance the causes of peace and peace-making for the past 25 years, with a notable success in Northern Ireland in the 1990s. In Northern Ireland, the forced segregation of Catholic and Protestant children in segregated schools helped fuel the conflict. The local political and religious establishment strongly opposed integrated schools, seeing them as a threat to the status quo. But most parents understood this, so by using public opinion research to air the opinion of the “silent moderate majority”—that exists in nearly all societies—it was possible to advance the cause and rights of Catholic and Protestant children to be educated together. As early as in 1968, public opinion polls were reporting that a significant percentage of the population wanted their children to go to integrated schools—from a low of 30% to a high of 70%. However, by the mid 1990s, at the height of the conflict, only 2% of these children were in integrated schools. Armed with this polling evidence and signed affidavits from parents, I was able to take a human rights case to the Rights of the Child Committee in Geneva in 1994. They ruled that the UK government should put more resources into integrated education. The “silent majority” were given a voice through polling and they had won. By giving this silent majority a seat at the negotiating table, so to speak, peace was achieved with the signing of the Belfast Agreement in 1998. I conducted nine public opinion surveys in support of the Northern Ireland peace process, between April 1996 and February 2003. The questions for eight of these polls were drafted and agreed with the co-operation of party negotiators. This helped strengthen the peace process by including more parties, developing the issues and language, and increase the overall transparency of negotiations through publication of technical analysis and media reports. Since then I have extended this work to conflicts in the Balkans, Middle East, Kashmir, Sri Lanka and relations between the West and the Muslim World, all reviewed in my book, “The People’s Peace’”. It is important to spell out the issues, so that people can have a clear opinion on them, and not discuss human rights in the abstract. The Northern Ireland polls dealt with major human rights issues, but they had to be unpacked for the population. Human rights had become highly politicised, with the Catholic minority demanding their rights, while the political leadership of the Protestant majority denied their abuse. So when asked about human rights in general, the Catholic community wanted strong progressive remedial action, while the Protestant community were, in general, indifferent. But when the issues were unpacked into, for example, the right to life, free and fair elections, or an end to discrimination, the Protestant community were as strong on their support of human rights as the Catholic community. Hence, it is important to spell out the issues, so that people can have a clear opinion on them, and not discuss human rights in the abstract. But some specific issues can also become highly politicised. One of the best examples is the Israeli settlements built on Palestinian land, in the Occupied Territories. Prime Minister Benjamin Netanyahu used Israeli public opinion to derail peace negotiations in 2009 through a series of “partisan polls”. Published in the Israeli press, the polls demonstrated popular opposition to a freeze on settlement construction. The polls were, however, heavily flawed on two counts. Firstly, the questions were only asked and reported in Israel. The Palestinians were not asked the same set of questions, with their views reported alongside the views of Israelis. Secondly, questions about settlements were asked in isolation of other human rights abuses. Questions about rockets being fired by Palestinians from Gaza into Israel were not included. When I ran a peace poll on both a settlement freeze and an end to rocket attacks in both Israel and Palestine, I surprisingly got similar results in both communities. Seventy seven per cent of Israelis considered a settlement freeze “essential”, “desirable”, “acceptable” or “tolerable” with only 23% saying it was totally “unacceptable”. The percentage of Palestinians for or against an end to rocket attacks on Gaza, were the same. 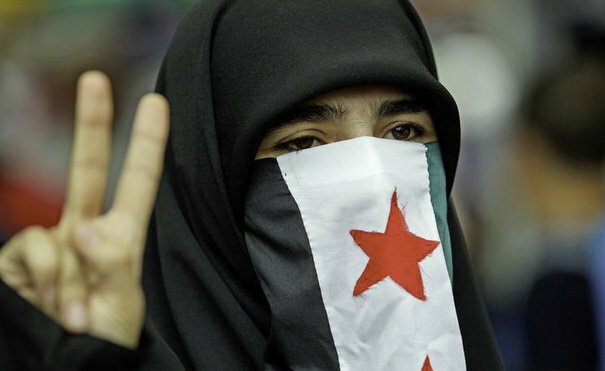 A Syrian women participates in a silent protest for peace. In Northern Ireland this result would have been seized upon by the talks chairman, Senator George Mitchell, as an opportunity for political compromise, to move the peace process forward. The Netanyahu government, however, had no such interest. Mitchell, now President Obama’s special envoy to the Middle East, subsequently resigned his post. I was advised to focus on Syria since this conflict was not subject to the intrigues and influence of Washington-based Democrat, Republican and Israeli political interests. But political intrigues have defeated me in Syria as well. In Syria, the polling work is dominated by governments who spend hundreds of millions of dollars on private polling around the world, in support of their respective interests, which are basically biased. The people of Syria want a national dialogue to write a new constitution to human rights standards. But the opposition in Istanbul, supported by the Gulf States and Washington, and the regime in Damascus, supported by Iran and Moscow, are not on the same page. They want peace on their own terms with the views of the people of Syria deleted from their political calculations. This in my view is a gross violation of their human rights, their right to peace and the right to life.